When Trevor’s mum offers him cash to walk the dog during the holidays, he’s delighted. Easy money! But Streaker is no ordinary dog. She’s a rocket on four legs with a woof attached! She doesn’t do walking – only racing, with poor Trevor flying on the end of her lead. So when horrid Charlie Smugg bets Trevor he can’t train Streaker by the end of the holidays, Trevor and his best friend Tina have a race on their hands. Using roller skates, a mobile phone and a bicycle, can they find a way to make Charlie eat his words? From runaway talent Jeremy Strong, this dotty dog comedy never slackens its pace. Can you draw a WANTED! poster for a naughty pet who has got into trouble? 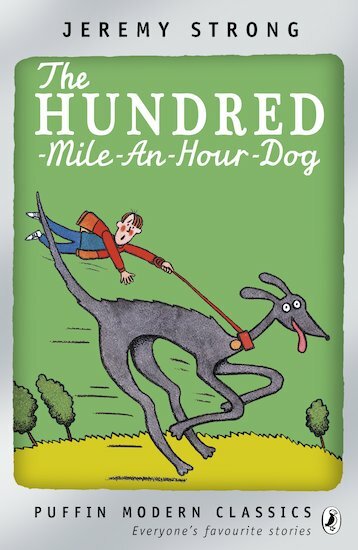 If I had the Hundred-Mile-An-Hour Dog, how my life would be!? It’s comical. A funny book about Trevor and his dog Streaker. entertaining book! i love dogs!!!!!!!! Its soooo good AND Soooo GREAT.